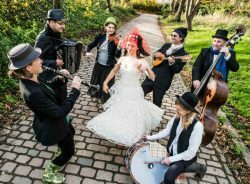 SHE’KOYOKH, Britain’s best Balkan and klezmer band, have a short Artsreach tour in February, bring their exhilarating blend of Balkan, Turkish and Jewish Eastern European music to Frampton village hall on Friday 15th February and Shillingstone on Saturday 16th. The seven international, virtuoso musicians have spent 17 years absorbing the rich folk music traditions of the region, fusing and celebrating the polyphonic melodies and intricate rhythms of Bulgaria, ancient tunes from Serbian villages and exhilarating Gypsy dances from Romania, as well as soulful Sephardic songs and klezmer music from the Jewish tradition. Their repertoire also includes an Albanian folk song popular in southern Kosovo, a song from south-west Turkey about wild goats and unmarried women, a love song for a Gypsy girl with penetrating green eyes, a beautiful Armenian song about migration and a Yiddish Swing number from 1950s New York! She’Koyokh have performed on television and live on BBC Radio 3’s In Tune and World on 3, and performed at festivals including Glastonbury, Cheltenham and WOMAD. They won first prize in the International Jewish Music Festival in Amsterdam in 2008, and have been shortlisted twice for Best Group in the Songlines World Music Awards. This year, they will collaborate with the BBC Scottish Symphony Orchestra, and are also developing a show with the acclaimed South Indian violinist, Jyotsna Srikanth. With a sumptuous mix of violin, accordion, clarinet double bass, guitar and percussion, and vocals from acclaimed Turkish singer Cigdem Aslan, expect a night of exhilarating music. Posted in I Got Music on 7 February, 2019 .